A number of youth have been brought one step closer to creating the robots we all dream of, or see in the movies, during the RobotiKS Camp of 2016. While the first few days started off with rainy weather, none of the participants let that bring down their mood because they were driven by the love and passion for technology, and the need to improve the world they live in. With this goal in mind, IPKO Foundation with the help of Prishtina Municipality and Germia Recreational Center have brought together the tools, teachers, staff, and participants in a week full of fun, learning, and recreational activities to make a week that would be remembered a lifetime. All of the above were facilitated by the green beauties of the Germia National Park, creating a relaxing and creativity-boosting environment for the youngsters. RobotiKS kicked off with interesting facts about robots and their tasks throughout the world, accompanied by high learning spirits even in moapy, rainy weather. The participating kids formed a diverse crowd: from future engineers, to firefighters, architects, teachers, all of them had one important thing in common – wide eyes and curiosity for robots and programming! Some of the robots built during RobotiKS were not only astounding, but had behind them some of the best and sincerest intentions for the betterment and help of mankind. One robot was designed to help people with the disability of vision to better find their way through their everyday life, and others were designed to defend their territory and even follow lines on the ground and find their way through rooms. 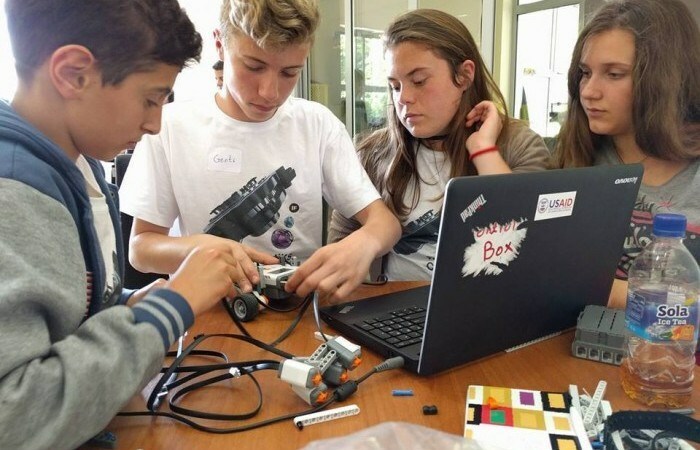 Using LEGO parts, the kids were able to employ programmable motors connected to sensors and controlled remotely through cable buttons and the LEGO Phone application which used bluetooth connection. This way the robots could find their way around different obstacles, move objects and even defend themselves from threats. To add to the fullness of the five day camp, sports and recreational activities were planned each day and implemented by Klubi Alpin Prishtina. Activities included practical learning about nature, need-to-know preparations for when walking in the woods, orientation skills using compasses, maps, and GPS systems, emergency procedures for when a team member gets lost or injured in the woods, and even climbing alpine walls with belaying equipment. Losing someone in the mountains sharpens your senses and teaches you to control your emotions. Not only was the lost camp-mate a great actor, but served a great purpose. Part of the simulation performed by Klubi Alpin Prishtina, consisted of finding someone who has been lost and possibly injured during a hike in the mountains, taking care of them and transporting them to safety using special transportation gear. They advised each hiker to never go unprepared, notify the Police Station of the hiking area, and always keep count of the team members. Even a whistle was part of the lessons, and the group learned the international way of emergency whistling to inform people near you that you are in trouble! Meeting your dentist and listening to math lessons is not the most fun thing in the world – we all know that – but at RobotiKS, meeting the dentist was turned into a great informational lesson, and math-talk was all about motivating the youngsters to find ways in which math helps with everyday life and tasks. All around, RobotiKS was designed and implemented to create a five day long informational package about robots, nature and life for its participants, and has been a great experience from start to finish. Inherited from Basic Education Program – USAID, RobotiKS would not have gone so smoothly without the help of our supporters and sponsors. We take the opportunity to thank the Municipality of Prishtina, Gërmia Recreational Center, Basic Education Program – USAID, AdaptivIT Engineering, UBT – Higher Education Institution, Furra Lumi, Kosovo ICT Assosiation – STIKK, BOTEK, Mr. Gzim Ramizi, and a special thank you to the media coverage from RTV 21 and KlanKosova TV.